The Holocaust: How did this Unprecedented Atrocity Unfold? The majority of scholars would argue that the outcome of World War I created right-wing groups such as the Nazi party. Germany's defeat ultimately forced certain individuals (including Adolf Hitler) to become radicalized. Hitler went to Munich, Germany in 1914, where he volunteered for service in the German army. Hitler was twice decorated for bravery and consistency, but only rose to the rank of corporal. When World War I had ended, Hitler was hospitalized after becoming temporary blinded by a British-launched poison gas attack. According to many historians, Hitler argued and screamed at fellow German infantry men, especially those who were Jewish and Communist. In some cases, he even engaged in physical confrontations with them. Hitler could not comprehend how Germany lost the First World War. While in the German army, he decided to direct his anger towards certain groups of people. The Versailles Treaty that ended the war, stripped Germany of much of its territory, forced the country to disarm, and ordered Germany to pay huge reparations. This treaty put the final dagger into Germany's heart. Germany was completely bankrupt and millions of people were unemployed. Eventually, Berlin became the suicide capital of the world because people just couldn't live under the conditions that Germany had to offer. Hitler joined the German Worker's Party (precursor of the NSDAP) in 1919, and became leader of the NSDAP in 1921. Over the next few years Hitler attempted to enlarge the NSDAP and tried to take over the German government. He attempted this in 1923 and was unsuccessful. This ultimately led to a five-year prison sentence (After nine months in prison, political pressure from supporters of the Nazi Party forced his release.) In prison, his first memoir, Mein Kampf was written. In the book Hitler repeatedly blamed the Jews and Communists for all of Germany's problems. He also claimed that the Jews were Germany's true enemy. Once out of prison, Hitler gained immense popular support by attacking the Treaty of Versailles and promoting anti-Semitism, anti-communism, pan-germanism, and Nazi propaganda. Hitler slowly gained oratory skills and his speeches consistently denounced international communism and capitalism as being part of a Jewish conspiracy. Over time, his audience slowly increased in size. Many people still saw him as a joke and in some cases they threw beer bottles at him. By the late 1920s, Hitler was seen as a threat to many of the political parties inside of Germany. By 1930, Hitler promised to rid Germany of Jews and Communists and to reunite the German-speaking part of Europe. After years of being the minority political party in Germany, the Nazis received about 40% of the vote by July of 1932. This officially made the Nazi party the strongest political party in Germany. On January 30, 1933, President Paul von Hindenburg appointed Hitler as Chancellor of Germany. Once in this position, Hitler moved quickly toward attaining a dictatorship so that nobody would pose a threat to his political position. Hitler already had control of Germany in 1934, even before von Hindenburg died. Hitler purged any political adversaries within Germany as well as anyone who posed a direct threat in neighboring German-speaking nations. That same year, Hitler ordered the assassination of Austrian dictator Engelbert Dollfuss. This was a controversial stance that the Nazis took, mainly because Dollfuss was close allies with Benito Mussolini. Furthermore, Hitler knew that getting Dollfuss out of the picture would eventually make room for the Anschluss. Hitler took the chance, even though in the end, it did indeed bring German-Italian relations to an all-time low over the next few years. At this time, Germany had a Jewish population of around half a million people. The Nazis established Dachau concentration camp near Munich, which was followed by Buchenwald near Weimar in central Germany, Sachsenhausen near Berlin in northern Germany, and Ravensbruck camp, which was designed specifically for women. These camps were used for forced labor and the conditions were so atrocious that many inmates died of hunger and disease. Most scholars would agree that this was one of the first stages of the extermination of the Jewish people. The SS (Schutzstaffel) was another entity that the Nazis used to eradicate the Jews from Europe. Eventually, the SS would create paramilitary death squads (Einsatzgruppen) that were responsible for mass killings, primarily by shooting their victims. There primary targets were civilians, chiefly Poles, Soviets, Jews, and Gypsies. The SS would collaborate with the Gestapo (Secret State Police) which organized the interrogation and arresting of Jews. German law then banned Jews from operating businesses, owning land, participating in the arts, writing and editing newspapers, joining the military, and receiving health insurance. Many holocaust historians would agree that the Nazis not only attempted to remove Jews from society, but also developed a multipronged approach to eliminate a number of their enemies simultaneously. Other laws were passed which forced sterilization of those found by a Hereditary Health Court to have genetic defects. The Nazis later passed a Law against Habitual and Dangerous Criminals, which forced the homeless, alcoholics, and the unemployed to be sent to concentration camps. Furthermore, laws were passed which forced abortions on women to prevent them from passing on hereditary diseases and an Office was established for Combating Homosexuality and Abortions (by healthy women). The Nuremberg Laws were just another tool used to limit the rights of Jews in Germany. These laws would become a precursor to more stringent laws that would evolve against the Jewish community. Eventually, Jews were banned from many professional occupations including becoming teachers, accountants, lawyers, doctors and dentists. They are also denied tax reductions and child allowances. By 1938, the SS became more powerful and Heinrich Himmler, Reichsfuhrer of the SS, expanded concentration camps in newly controlled German occupied territories. During the same year, Jews were ordered to register property, forced to stop providing commercial services, and were forced to where identity cards. Nazi law also required all female Jews to add Sarah and men to add Israel to their names on all legal documents including passports. Over the next year the conditions for Jews only worsened in Germany and German occupied territories. Many neighboring nations did not collaborate with Jews, but rather with Nazis, and these nations enforced their own versions of the Nuremberg Laws. On January 30, 1939 Hitler made a speech which directly threatened the remaining Jews of Europe. Many high-ranking Nazis including Reinhard Heydrich, were told to speed up the emigration of the Jews, this was a direct order from Hermann Goring. This led to the confiscation of all silver and gold owned by Jews, denied Jews the right to work in the government, and denied Jews the right to be tenants. Moreover, Jews were forbidden to be outdoors after 8 p.m. in the winter and 9 p.m. in the summer. This curfew was tightly enforced and if any Jew disobeyed the order they were severely punished. The German government had the ability to expand their propaganda by releasing a newspaper entitled Der Sturmer (The Attacker). By 1938, half a million copies were distributed weekly throughout Germany. The bottom pages of the newspaper said “The Jews are our misfortune”. Another famous quote in the newspaper stated "The Jewish people ought to be exterminated root and branch. Then the plague of pests would have disappeared in Poland at one stroke." Directly after the invasion of Poland on September 1, 1939, Heydrich issued instructions directly to the Einsatzgruppen regarding treatment of Jews, stating they are to be gathered into ghettos near railroads for the future "final goal." He also ordered a census and the establishment of Jewish administrative councils within the ghettos which implemented brutal Nazi policies and decrees. At the same time, the euthanasia program began in Germany, neutralizing all the sick and disabled. Once the Nazis had control over most of Poland, many high-ranking SS members took steps to set up the blueprints what later became known as "The Holocaust”. As more Polish Jews were treated horribly, Adolf Eichmann became more involved with Polish affairs. He eventually took over parts of the Gestapo operating throughout Poland. Eventually ghettos were established where Jews would be forced to live. The conditions were appalling because disease spread quickly and food was virtually non-existent. Over time, many ghettos were either liquidated or transformed into concentration camps. On January 20, 1942 the Wannsee Conference was held. The conference was established by Heydrich. Heydrich wanted to ensure that cooperation occurred between administrative leaders of various government departments and that these departments implemented steps to guarantee that they understood what the final solution to the Jewish question was. Many high-ranking Nazi officials all agreed that the Jews of German-occupied Europe would be deported to Poland and murdered. Throughout the meeting, Heydrich outlined how European Jews would be rounded up from west to east and sent to extermination camps, where they would be executed. The Wannsee Conference assured SS leadership (primarily Himmler, Heydrich and Eichmann) that the extermination of the Jews was definite and would be orchestrated in a discreet, but efficient manner. Many high-ranking SS leaders all agreed that the extermination process would be chiefly orchestrated in Nazi-occupied Poland. Why Poland and not another European nation? At the time, many individuals were more aware of what happened in France, Spain, Italy, Belgium, and the Netherlands. Poland was one the nations that did not receive much media coverage. Moreover, after 1941, Nazi Germany forced the Soviets completely out of Poland. Any media coverage in Poland would be completely controlled by Joseph Goebbels, he agreed never to mention anything about the extermination process. Railroad lines were another major reason that Poland was chosen over other European nations. Major European rail lines ran directly through Germany and linked up to Poland. Lastly, Poland had a large Jewish population at the time. The number of Jews in Poland on September 1, 1939 amounted to about 3.5 million people. In Germany, Hitler and the Nazis succeeded in segregating the Jews from the rest of the population mainly by implementing laws which allowed them to. Another key tool that the Nazis implemented were the use of Jewish Councils (Judenrat), these councils forced Jews to manage local communities. In many cases, Jewish council leaders organized and maintained paperwork and confiscated valuables in ghettos. Many holocaust historians still debate today why these Jewish council leaders collaborated so easily with Nazi authorities. In some cases, resistance was seen, but the majority of the Jewish council leaders failed to resist. There has been much debate among historians as to why the Nazis set out to exterminate the Jews. Some have stated that it had always been Hitler’s plan from the beginning to exterminate the Jews, while others have perceived the mass murders as a result of a long and curved process, where Nazi policy was gradually radicalized over time. The Jews’ presence in the German-occupied parts of Europe was seen as a major problem to the Third Reich. Nazi policy strongly advocated eradicating these individuals from the face of the earth. Initially, early Nazi policies attempted to solve the problem by using voluntary immigration, forced immigration, and several different plans for deportation. Plans surfaced to deport all the Jews to the east, first to eastern Poland, then to ship them by rail to Siberia. Serious plans were also developed that included deporting all European Jews to the east African island of Madagascar. All these plans had to be dropped, however, because of the war that started in Europe in 1939. At the same time, the Nazis had gained experience with systematic mass murder in the form of the Euthanasia Program (mainly orchestrated in German hospitals), where physically and psychologically disabled were killed by the state. This constituted the crossing of an important psychological barrier. Many Germans in the medical field did not feel any form of remorse or guilt as they went ahead with the program. Some historians believe that Nazi ideology was the chief reason behind the willingness of medical professionals to engage in this activity. Another such barrier was crossed with the beginning of the Germans’ cruel war of extermination against the Soviet Union (primarily with the use of the Einsatzgruppen), which commenced in June 1941. This was just another tactic that Nazi Germany used in order to the wage war against Judeo-Bolshevism. Ultimately, many high-ranking Nazi members were frustrated when the deportation plans of the Jews were unsuccessful. Furthermore, the experiences with the euthanasia actions were met with little success, and the war with the Soviet Union, which did not rid all of Europe from Jewry. Scholars would argue that Nazi vexation and compulsion eventually led to another route that had to be experimented with. In the end, extermination camps would be the method used to mass murder the Jewish population. This method was used because every other method was either; too long of a process or had to be done in cooperation with the military (mainly Einsatzgruppen or other SS divisions). Eventually, the SS would take over the operation of the concentration camps (SS-Totenkopfverbande). Under the direct orders of Himmler, the SS-Totenkopfverbande would bear responsibility for some of the worst crimes against humanity. One can conclude that Nazi officials were not just preoccupied, but ardent with “The Final Solution to the Jewish Question”. In the end, it led to the systematic annihilation of approximately 6 million Jews and thousands upon thousands of others. Very interesting historical account of the Holocaust. Thank you. It's incredible how proper media management and euphoric speeches and ruthless foreign policies can change the mentality of a nation. Yes, Germany at that time wanted a change, and Hitler seized that opportunity. What happened? one of the biggest mass control campaigns ever created, it was done incredibly well. Hitler as a leader has my respect, but as a human being, he was repugnant. 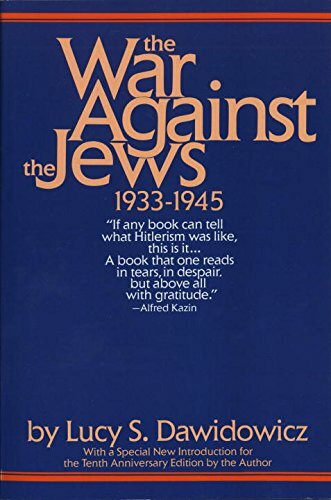 Lucy S. Dawidowicz The War Against the Jews: 1933-1945 . New York: Bantam, 1986.